USA buyers : shipping is not $4, but is $10 minimum. 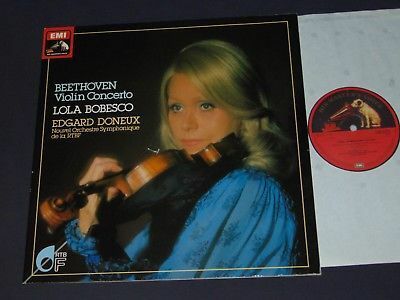 BEETHOVEN violin concerto, Lola BOBESCO nouvel orchestre symphonique rtbf DONEUX ; emi vsm 1a 0651651801 stereo lp, gatefold cover. The cover is 9,8/10, neat, the record is 9,9/10 a couple of non audible ultra light scuffs, otherwise as new, playing 9,9/10. Please finalise the deals within 2 weeks, thanks.